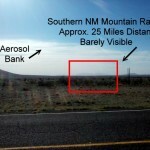 A significant set of observations has taken place in May 2007, as another major aerosol operation was conducted over the skies of the Santa Fe, New Mexico region. Pictures taken of this operation, and a more detailed visual examination of some of these emissions have been made than in previous observations; mechanical, artificial and systematic introduction of the aerosols appears evident. There are two primary observed anomalies at this time: the first of these is the presence of what may be referred to as "core tracks" (ribbon-like; possibly filamentous in nature) in the spray lines, and the second is the repeated presence of a characteristic "pulse" emission. The behavior and character of these anomalies is now being presented and an adequate basis for further examination exists with this article. These characteristics are completely out of accordance with any claims of meteorological discontinuities in the atmosphere, any uniform fluid or gas dynamic analysis, and any unmodified combustive process. It is apparent that distributions of discrete material into the atmosphere are taking place. Reports of orbs, or lighted spheres, have occurred frequently during recent years and these reports appear to frequently coincide with the aerosol operations. 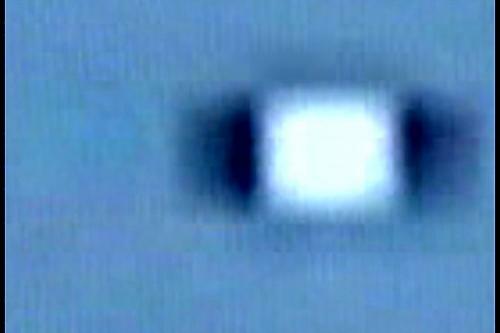 Isolated but credible photographs of such orbs have been brought to Clifford Carnicom's attention in the past, but Carnicom refrained from presenting this information due to the lack of corroboration and redundancy in the imagery evidence that is available. 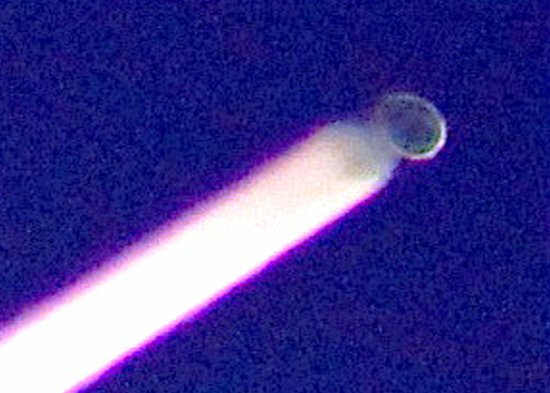 Presented in this paper are pictures and a video of an orb that he witnessed in Santa Fe, New Mexico on March 10, 2004 while filming aerosol operations. The character of the object is generally that of a ball of light, and examination of the video reveals several interesting aspects: the physics of motion of the object defy common explanation; there is no obvious propulsion system visible; and the movement of the object is generally non-linear. This paper reveals that an operational term of "CLOVERLEAF" for the criminal aerosol operations that continue to be conducted without informed consent has been corroborated from numerous independent and unrelated sources extending over a period of several years. This term is therefore presented to the public as a credible avenue for research and investigation in the future. 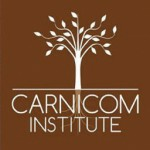 Two more photos were submitted to Carnicom.com by a concerned citizen. 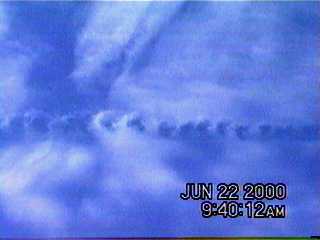 The first shows a Megasprayer spraying aerosols taken on July 5 2001 at 9AM in Diamond Springs, CA. 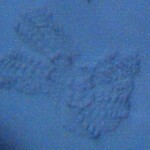 The second photograph is a satellite image showing very clear, obvious and heavy aerosol lines off the coast of California on July 24, 2001. 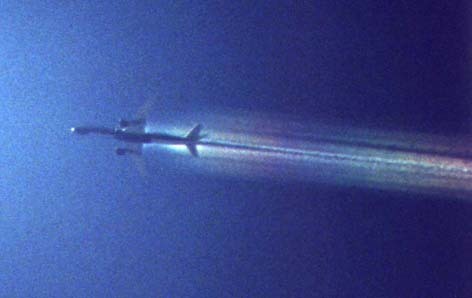 Photographs were captured and presented that show the effects of a non-aerosol spraying plane ‘cutting through’ a cloud layer, and the resulting evacuation of the clouds from the plane’s flight path. The absence of mass of the cloud materials after the plane passage shows the clouds to have density, form and behavior unbecoming of water vapor, and have all the appearances of being at least in part of a synthetic nature. The photograph captures demonstrate these ‘clouds’ not being fully of water vapor as may commonly be assumed. After reading the account of the airline mechanic in the previous Carnicom paper titled “A MECHANIC’S STATEMENT (dated May 19, 2000), an anonymous upper level manager from an unnamed airline was compelled to write to Clifford Carnicom. He stated that the mechanic’s story was true, and that he had information regarding this airline’s participating in Operation Cloverleaf, which is known to be a military aerosol operation. He and other workers were briefed on this operation, background checks were performed on everyone involved, and they were forced to sign a non-disclosure agreement stating that if they said anything about the program they could be imprisoned. They were informed that the government was going to pay the airline to release special chemicals from the commercial aircraft. When asked what the chemicals were, they were told this was on a need to know basis only. They were also told that there weren’t enough military aircraft to spray these chemicals, which was why the commercial airlines were paid to release these chemicals. This was the main reason Project Cloverleaf was put into existence. The manager expressed grief for being involved in something that he felt was poisonous, and apologized for needing to maintain anonymous. An aircraft mechanic wrote to Clifford Carnicom and told his story about working as a maintenance technician at a large airport. After outlining the pecking order of the mechanics and reciprocal agreements among airliners at airports, this mechanic spoke about being asked to work on the waste disposal system on a plane for another airline. After climbing inside the plane, the mechanic noticed that there were additional tanks, pumps, and pipes than normal, and they weren’t attached to the waste disposal system. Confused about this extra equipment, the mechanic looked up the additional equipment on the company computer, but found nothing. Climbing into another plane during inspections, he found another plane with the extra equipment, including what looked like a holding tank. After following some of the piping, the mechanic realized the piping went out to nozzles at the end of the wings. The mechanic had been spotted by management and was confronted about doing this investigation by managers and union reps. He was accused of falsifying paperwork for a job he did, and later received an anonymous phone call at home with the caller saying ‘Now you know what happens to mechanics who poke around in things they shouldn’t.” After finding the Carnicom web site, the mechanic wrote this letter to Clifford Carnicom attesting to the fact that the airlines are indeed spraying from these airplanes. 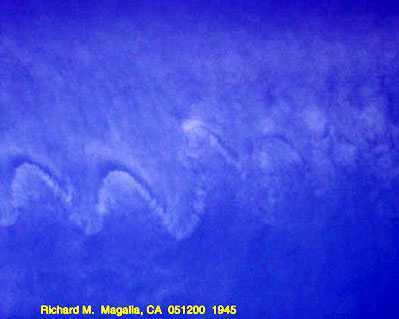 A witness captured a photograph of a highly unusual aerosoll on May 12, 2000 at Magalia, California around 7:45 pm. 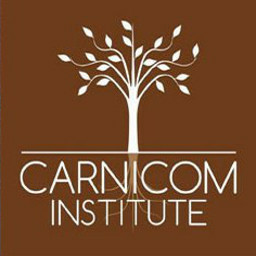 The section of the trail that was captured and sent to the Carnicom Institute shows a strange curving snake-like wave within the trail itself. The camera setup that was used to take the photo is described as well.